Well, this is it folks, the last "official" day of summer. While I am hopeful the warm weather sticks around for a while, we are hankering down and getting ready for the new school year. Max starts 2nd grade tomorrow and Alec will begin his school career with Kindergarten on Wednesday. Hard to believe they are both old enough to be in school all day. Yikes! Where has the time gone? With school starting, there are lots of things we've been hankering: sorted through all the kids' clothes and figured out what fits and what doesn't and made a quick trip to the store to pick up a few pairs of pants and shirts to get the year started off right. I've also been purging lots of their toys that they have grown out of - craigslist is full of wonderful boy toys now just ready for their new owners. We have also re-vamped the Free Time Chart. With school starting, and no doubt more homework coming, the boys' free time has been changed. The boys also have new interests and what they like to spend their earned tokens on. Therefore, we eliminated TV time altogether. (This is not to say they won't be watching TV, they just won't need to use a token for it and it will be at our discretion. If they've behaved and maybe helped out a little extra around the house, TV time will be permitted.) 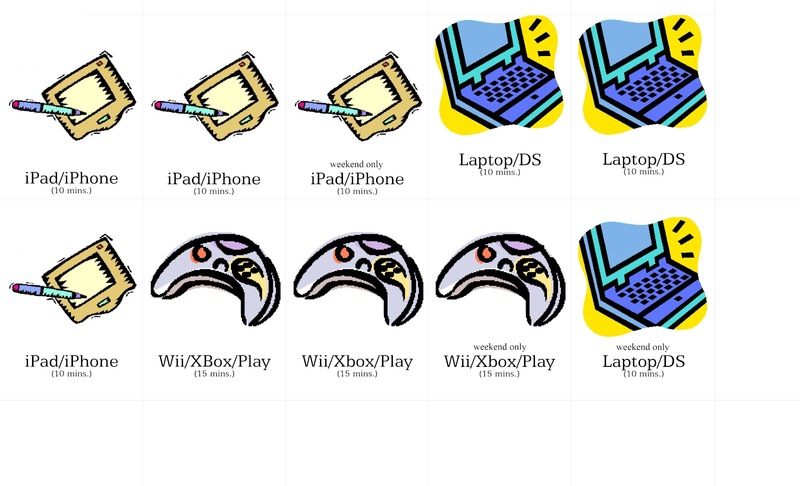 Instead, we've now listed the iPad and iPhone, added the XBox and Playstation, and limited computer bits to the laptop only and the Nintendo DS. The other change we've incorporated is the number of slots they can use during the school week. Only two slots per item now instead of three; the third slot only opens on weekends. We are all very eager to see how the new Free Time Chart works and it will hopefully work for you too! Next on the list was reviewing the chore cards. There are 2 or 3 cards the boys ALWAYS do for their chores. Not sure why, but I imagine it's because they think they are the "easiest" to do and get a token or money for. So, those are the cards that get removed at review time, as they become expected behaviors and not those that are the easy things to do anymore. 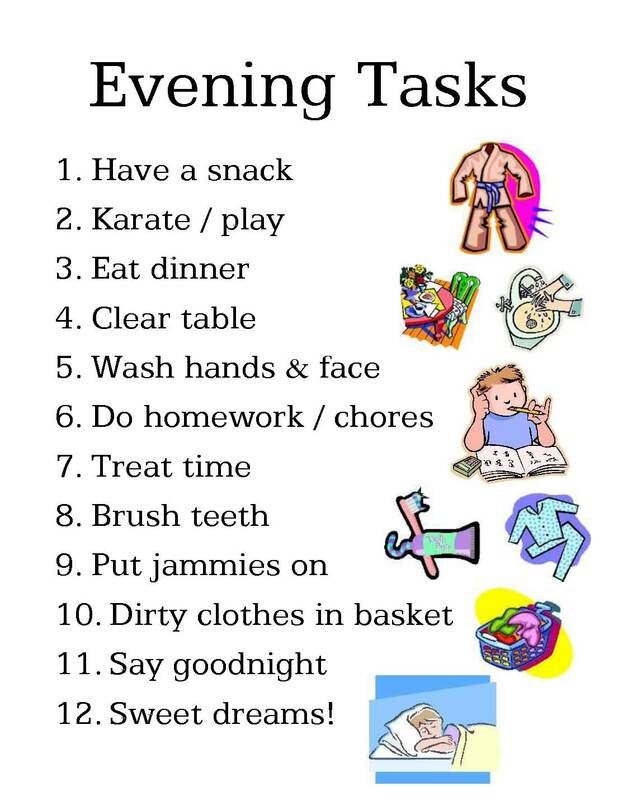 Not to mention, the boys are getting older and now that they have been doing these things regularly as "chores", they have learned that they are just things we do every day in our family. This latest review session resulted in the elimination of Make Bed, Put Jammies Away and Put Dirty Clothes in the Laundry Basket as chore cards. 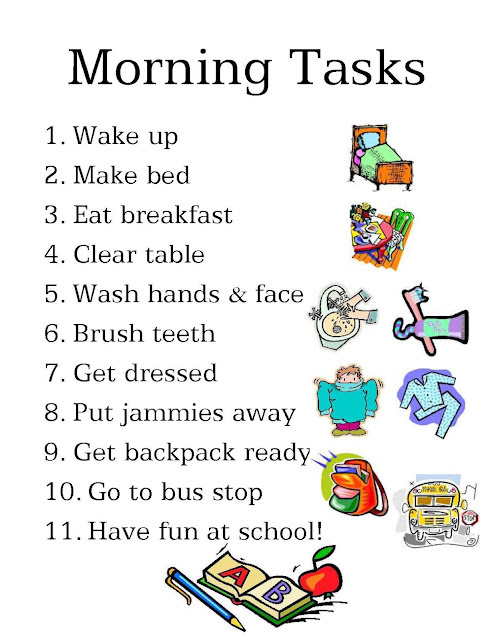 They are now included in our NEW Morning and Evening Tasks Lists! I have to say I think they will work. The boys will not need me to remind them what to do next as they begin and end their days. 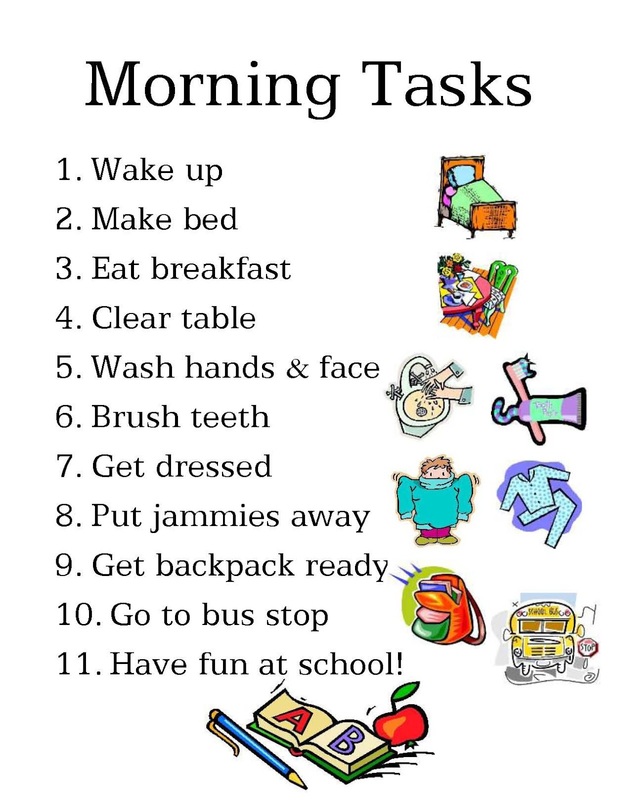 They can use them somewhat like a checklist, it aids in their reading skills, and they know what to expect next. All good. Feel free to print it out for yourself. I just used the same clip art that I used for the chore cards (found on the For You page), so it ties in nicely and gives them the visual clue. And helps them remember! Can't beat that! I really hope this helps alleviate some of the morning chaos we've had in years past. Thank goodness for our fabulous bus driver who always waited, and sometimes even honked, to let us know she was ready for us. We know we will always have a karate class on more days than not, so I included that. But on the couple of days we don't have to go, they get to use that time to play and decompress. (You may print this one for yourself, too, but I realize karate may not be part of your evening. If you do have a preference for something else, just let me know. I'll put a different one together for ya in no time.) Once dinner starts, it's on to the evening "to-do's". 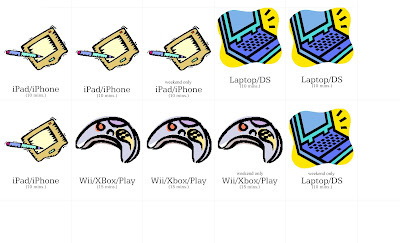 Again I used the same clip art to tie things together. While I meant to include a spot to remind them to record their chore cards for the day, perhaps we can just slip it in with #6? Why not? Here's to a great school year! Have fun everyone!